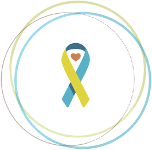 At ds-connex we work with many Down syndrome organizations. Each one varies in size and support services. But the one thing we have found is no matter where you go, you are always welcomed with open arms. We came across an example of this recently with two of our ds-connex partners, Green River Area Down Syndrome Association (Owensboro, KY) and Heartbeats for Down Syndrome (Brockton, MA). 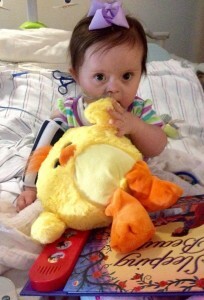 One of GRADSA’s Buddy Walk® teams, Sweet Anna Sue, is named for Anna Sue, a 2-year-old with Down syndrome. Anna Sue has endured multiple surgeries in her young life due to issues with her heart and esophagus. After receiving treatment at Kosair Children’s Hospital in Kentucky, Anna Sue went on to Boston Children’s Hospital for additional care. Her home Down syndrome organization, GRADSA, continued to support Anna Sue from afar and kept their community updated on her progress. While in Boston, Anna Sue’s family was also contacted by a local parent support group providing care packages to kids facing surgery, called Heartbeats for Down Syndrome. The parent group is comprised of four moms who each have a child with Down syndrome who needed heart surgery. One of the group’s members visited Anna Sue at the hospital and presented her family with a care package to make their hospital stay a little easier. Anna Sue’s team went on to raise over $1,500 for their local walk. In addition, Cindy, went one step further and donated to the Heartbeats Buddy Walk® with a note that read, “You were there for us and delivered a nice care package while we were at Boston Children’s Hospital. Love to give back! Thank you!” Cindy gave with the desire to pay it forward, so another family facing a hospital stay could receive a care package like Anna Sue. Because when it comes down to it, no matter where you are from, we are all a part of one community with the goal to improve the lives of those with Down syndrome. To stay up to date on Anna Sue’s journey, follow along with the updates posted on the GRADSA Facebook page. 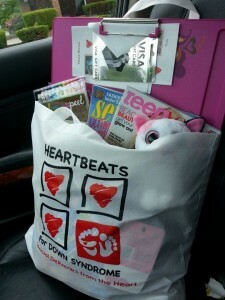 To learn more about Heartbeat’s care package program, visit their Facebook page.